My husband is a fanatic about chicken wings. He has his favorite dive restaurant that cooks them just so, and up until a few weeks ago, I didn’t make any wings in my kitchen that were as good to him as the ones at his local favorite restaurant. Well that all changed when I learned about the newest and greatest fried chicken wings ever, Korean Fried Chicken. 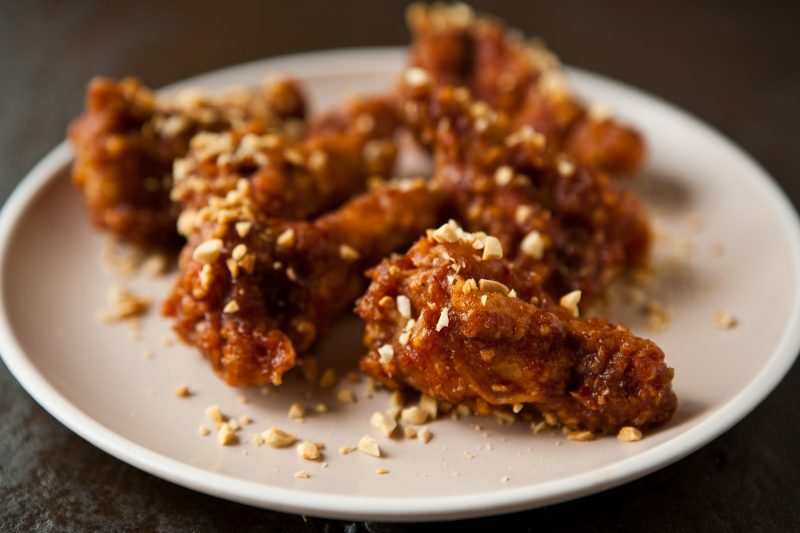 They are the crispiest, most wonderful wings ever tossed in the most delicious flavorful sauce that has ever passed your lips. But be warned, they can be extremely addictive. 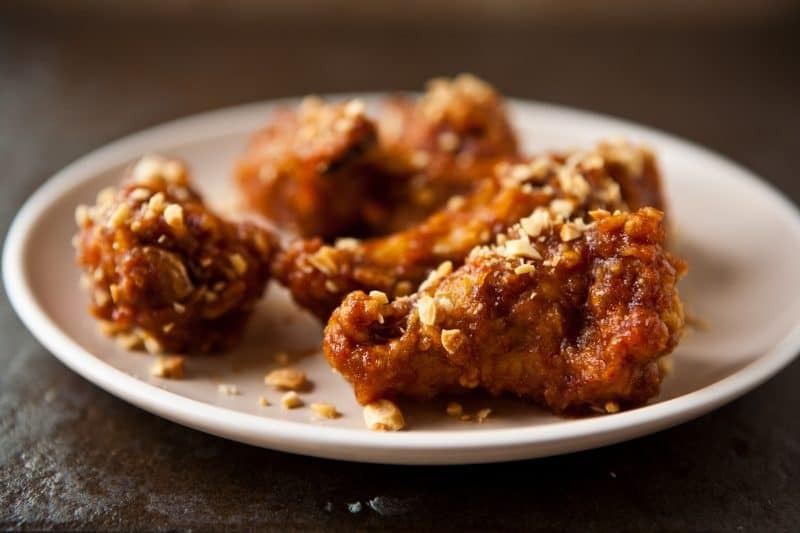 The secret to these ultra crispy wings is a very light breading on the wing paired with a unique frying method in which the wings are fried twice. You first fry the chicken until it’s a light golden brown, then remove it from the oil and let all the oil drain away and allow the chicken to cool for about 10 minutes. Then you fry the chicken again until it’s a deeper golden brown. This process helps to render out a lot of fat in the skin of the chicken wings, creating a crispy wonderful skin that won’t get soggy after you sauce them. 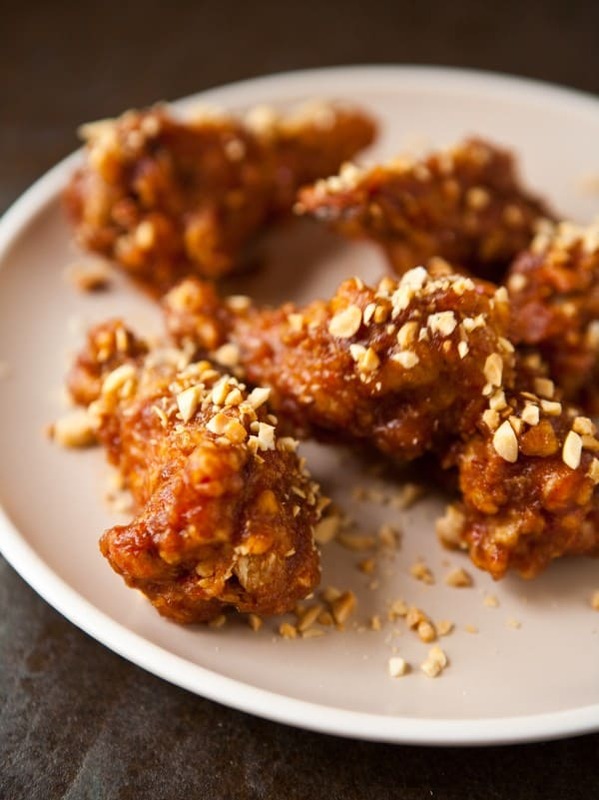 After the wings have cooked, you toss them in a sauce made with lots of garlic, ginger and Korean chili powder. The Korean chili powder has a beautiful distinctive taste. You can substitute a regular cayenne pepper in the recipe, but it won’t quite be the same. Alternatively, you can also use your favorite buffalo sauce to sauce these wings. This recipe was developed for Pillsbury.com. Preheat vegetable oil for frying to 350°. Combine flour, cornstarch, water, salt and pepper in a large bowl. Whisk well until blended. Dip each wing in batter and drop in hot oil. Fry at 350° until light golden brown, about 6 – 8 minutes. Don’t over crowd pan while frying. When wings are done, drain on paper towels or a cooling rack. Let wings rest for 10 minutes. While wings are resting, combine ingredients for sauce in a small bowl. Combine grated garlic, grated ginger, honey, sesame oil, vinegar, ketchup and Korean red pepper in a small bowl. Whisk well to combine. After wings have rested, drop them back in the hot oil and fry at 350° for 8 – 10 minutes, or until deeper golden brown. Drain on paper towels or a cooling rack after cooking. Toss wings with sauce Garnish with chopped peanuts and serve. Wowzers do those look good! My husband LOVES chicken wings too. He can’t get enough of them–I’ll have to give this recipe a try for him!